Звуковая аппаратура для музыкантов и музыкальных групп. Бэклайн и его место на сцене. The principle of operation of sound equipment and its location on the stage. his article we will devote all those who are not up to the end is the principle of operation of sound equipment, but wish to at his party was only performed live music and played music cover band. The basis of the concert of sound and its power creates an acoustic system. Basically it is two-way and three-way. In two-lane system dynamics respectively the high and low frequencies. In three systems there are high, mid and low frequencies. To all this is added the subwoofers, the basis of which speakers low frequencies. On stage speaker system are top on the edges to get the sound in stereo format. Subwoofers are located from below, under the main portal columns, sometimes at the edges and the center. This instrument is designed for the audience in the hall. For musicians on stage is another instrument, called the "backline". And many other equipment, depending on the group. 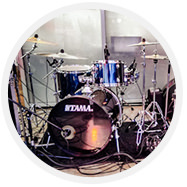 Most often the drum kit placed in the center of the stage, the guitar and bass in different parts of the stage to the guitarists do not interfere with each other. The frontman, of course, is center, keyboard player, depending on his function in the team. Sometimes the side of the stage, sometimes next to the soloist, sometimes the back. The rest of the band can be placed anywhere, it all depends on the composition of the team and their imagination. The main condition for the setting of the equipment on stage must be good audibility for all participants in the group to each other. For this there are stage monitors that can connect to multiple lines depending on the characteristics of a mixing console. In each line you can send any tools needed separate musicians. Monitors are installed at the edge of the stage on the front lines, as well as each member of the musical group in need of them. All music equipment (loudspeakers, stage monitors, guitar amplifiers, even your computer speakers, etc.) is divided into two types: active and passive. Active consists of speakers and a built-in amplifier, sometimes with a built-in equalizer. Is equipped with only passive speakers. For more on this you can read here. Mixing console is the link in the connection of audio equipment aimed at hall, backline and musicians. With the help of sound engineer manages the process of sound tuning and maintenance of the concert. If you do not delve into the topic of microphones also come in two forms: dynamic and condenser. The first to work without additional power, but the second just needs phantom power, which is included on a mixing console. In studios, on radio and where it is necessary to remove the common sound used condenser microphones, but on stage, when is a group, often use dynamic MICS, to exclude hit of extraneous noise and take only the desired signal. Therefore, if you decide to organize a celebration and order the musicians invite a musical group, acting in person, this article will help in choosing sound equipment. We recall once more that the team Orange VINIL also has sound equipment that you can rent or use for our presentation.